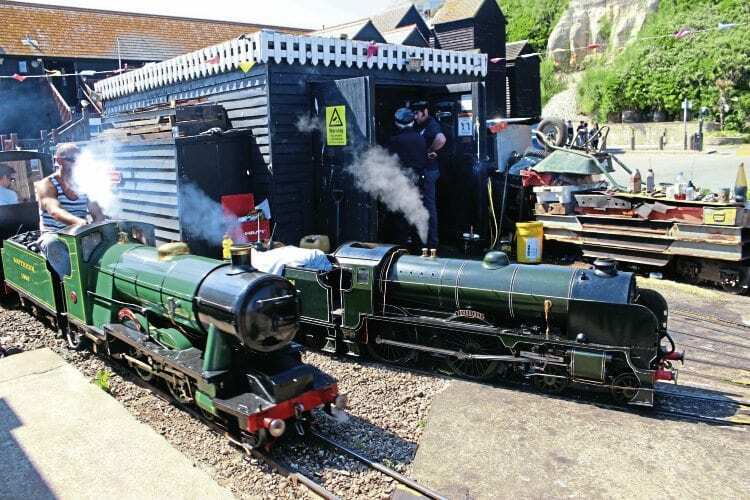 THERE were several visitors to the 10¼in-gauge Hastings Miniature Railway’s second 70th anniversary gala on June 30. Seen at Rock-a-Nore station are (left) Guest Engineering 4-4-2 of 1937 No. 1908 Ernest Henry Upton, from the Eastleigh Lakeside Railway, and from the private Ingfield Light Railway, ‘Schools’ class 4-4-0 No. 905 Tonbridge, built by Drummond Randall and Reg Day 1990s-2000s. Also present was original HMR 0-6-0 Firefly (HCS Bullock 3007 of 1936) from Kerr’s Miniature Railway in Scotland, which attended the previous event on June 2-3 (RM July, p80). Another gala takes place on September 29-30. Previous Post:Dual-control Jools – is it a unique steam loco?